If you follow me on Instagram, you'll know that I am obsessed with buying clothes for my children. When I had the opportunity to review for Tuta Kids, I jumped at the chance. Tuta Kids is new to the market and it was launched at The Baby Show. Their aim is to make children look stylish but feel comfortable at the same time. All of their clothes are crafted in Turkey and they have a designer feel but without the designer price tag. 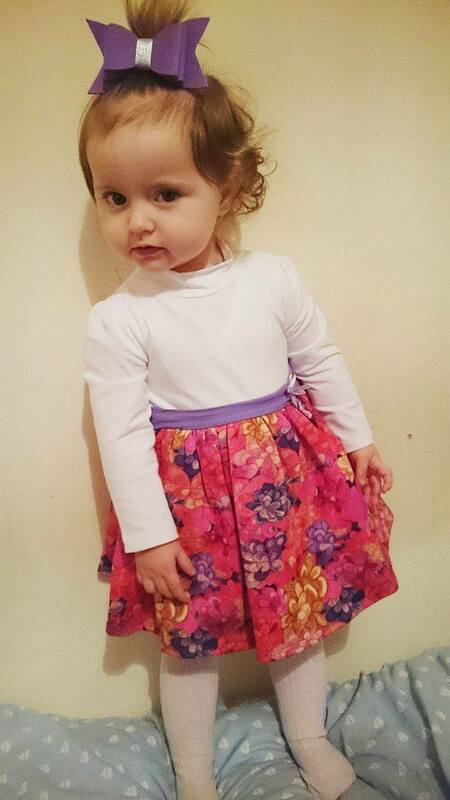 E received one of their gorgeous flower printed jersey dresses (£50.00) in size 12 months and I was excited to receive it just from the photo but once it was actually here, I was blown away. It is a million times better in real life. The quality is amazing. 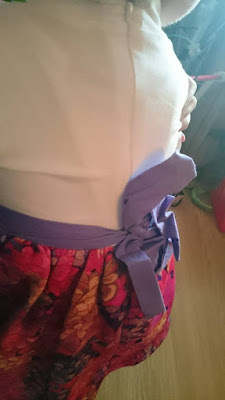 The skirt is made of a really thick material which makes it perfect for wearing in colder months and it has a super cute tulle material undernearth to help puff it out a bit. The detailing is impeccable. On the front where the belt is, there is a little dangling heart, a huge bow on the back and the zip is invisible which I love! The collar is my absolute favourite part of the dress. It just finishes it off and totally transforms it from a regular dress to a fancy upmarket one. It's 100% cotton and I honestly cannot rave about it enough. 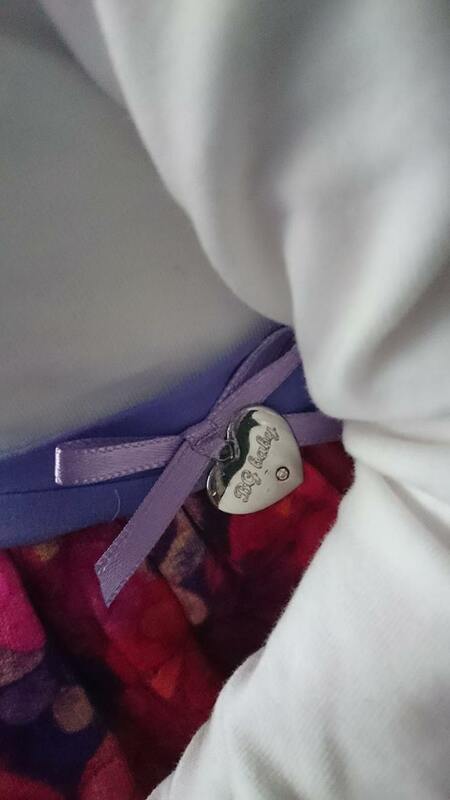 It's definitely one of my favourite items in E's wardrobe and we've had so many compliments on it. I will definitely buy from Tuta Kids in the future. If you'd like to get your hands on one for your daughter you can do so at the Tuta Kids website. You can also follow them on Facebook, Twitter and Instagram. The lovely people at Tuta Kids are also offering my readers the chance to win £50 to spend on their range. To be in with a chance of winning, all you need to do is fill in the Rafflecopter widget below. 125 comments on "Tuta Kids Clothing - Review and Giveaway"
I would buy the TROUSERS-3232NBN3203 - so hard to choose though as so much nice things! I'd treat my little girl to the Shimmer Striped Dress! Thank you and Merry Christmas! I love the Nature Lovers collection for girls so I would probably get the dress from there. There are some lovely pieces, I would treat my daughter to the blue shimmer dress! I would buy the RICCIONE Denim Dress and the RICCIONE Shimmer Striped Dress for my daughter. Absolutely gorgeous clothes on there. Was so hard to pick! A flamingo tee for my daughter! I'd buy the Pink Shorts and sleeveless T-Shirt for my daughter, ready for our holiday in Spain. I like the Riccione Shimmer Striped Dress. There are so many lovely options. The Riccione 3030ROR4906 dress - it's beautiful! Maybe the Stylish Down Jacket for Boys-3232NBN3708. Which I think would be lovely for a girl too. I'd buy the JUMPSUIT - 3030TJT4101 would look great on my little one this summer. I like the Riccione tracksuit top and bottoms. All the Riccione boys long sleeve t-shirts are lovely. Also a pair if jeans is always useful and those wonderful orange patterned swimming trunks. I really like the Blue Checked Shirt, very funky for my son. The Tyesse jeans would be lovely for my daughter. I would buy some of the lovely summer tops for my two girls. I love the Black Puffy Coat-3232TJT4722. Gorgeous! I love the tyess skirt and shirt! Don't think I could stop at buying just one thing, loving Skirt&Shirt Set-3232TJT4302. I would choose the Hooded Cardigan for Boys-3232NBN3704. I would choose the Gabardine Trousers-3232BBG1214 for my 18 month old and Grey Jersey Trousers-3232BBG1202. SHORTS - 3030NBN3102 - These are lovely and would look fab on my little boy! I like the Riccione Shimmer Striped Dress for my little girl. She will look so cute in it. Love the TYESS Dress, so adorable! For starters this!!! Been looking for something like this in town today but couldn't find anything! I'd buy the gorgeous TYESS sequineed tracksuit.